With Funding Gone, Last Undersea Lab Could Surface For nearly 20 years, the NOAA's Aquarius Reef Base has operated off Key Largo 60 feet underwater as the world's only undersea research station. The Obama administration has essentially killed its funding, and the staff is now working to find other money to keep the research station alive. A diver swims by the Aquarius Reef Base, a permanent working undersea laboratory off Key Largo, Fla., in the Florida Keys National Marine Sanctuary. The Obama administration cut the lab's funding, and now scientists are trying to save it. While you're enjoying your coffee this morning, half a dozen scientists are already at work. They're not sitting at desks, however, but a few miles off the Florida Keys, 60 feet down on the ocean bottom. The researchers are living and working this week at Aquarius Reef Base, the world's last undersea research laboratory. The 25-year-old facility, built by the federal government, has hosted everyone from marine biologists studying endangered coral reefs to NASA astronauts training for weightless missions in space. But the Aquarius Reef Base itself is now endangered. 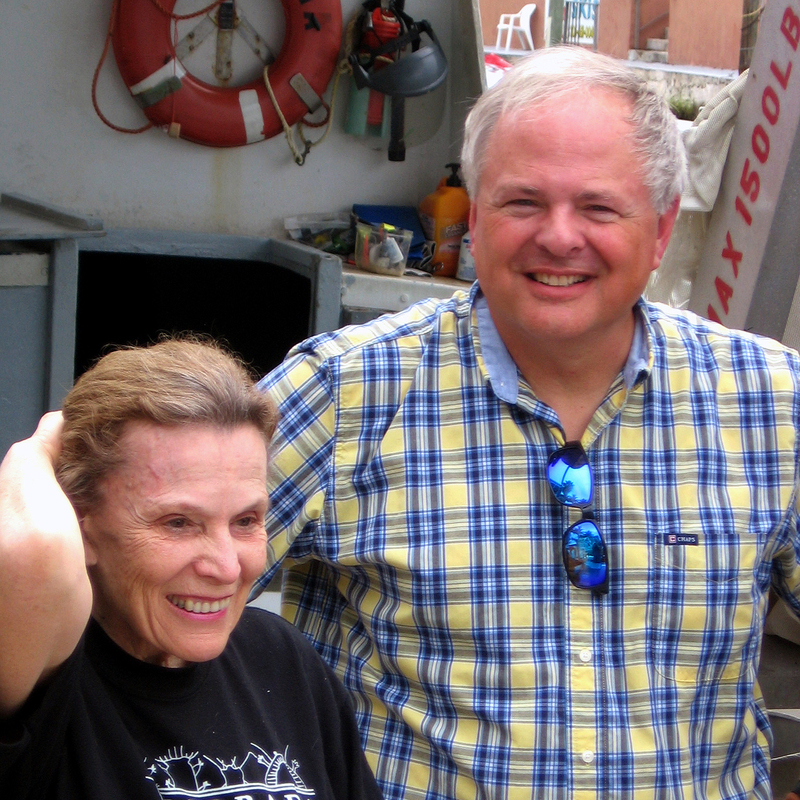 Among marine researchers, there are few people more distinguished or respected than Sylvia Earle. Former chief scientist for the National Oceanic and Atmospheric Administration and now explorer-in-residence at National Geographic, she's no stranger to what are called "saturation dives." 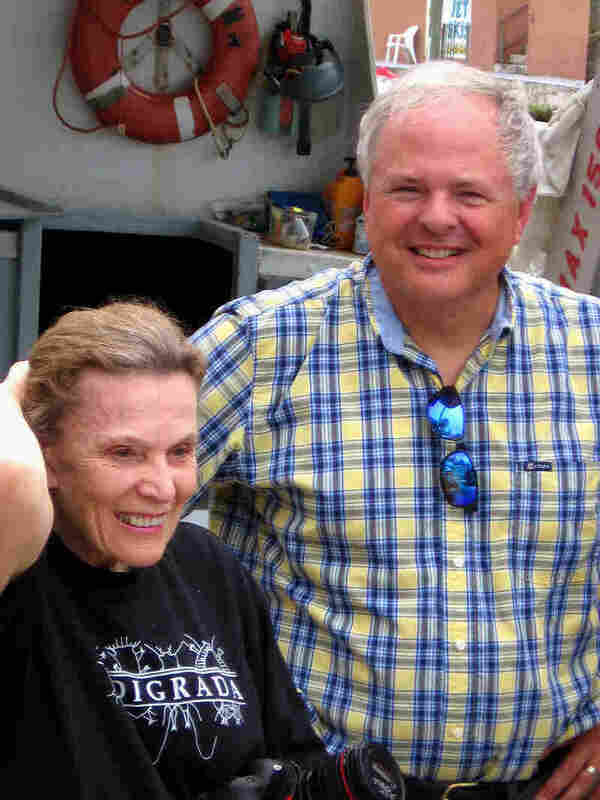 Researchers Sylvia Earle (left) and Mark Patterson are trying to raise funds to save the Aquarius Reef Base. Those are dives where people spend days, or even weeks, underwater. This dive, Earle says, marks an important scientific anniversary. It's been 50 years since saturation diving was first pioneered by underwater explorers Ed Link and Jacques Cousteau. "This is a historic event, and I was invited," Earle said. "I didn't knock on the door; they knocked on my door, and I said, 'OK.' "
In 1970, Earle led the first team of women to conduct a saturation dive — a two-week stay in an undersea lab off the Virgin Islands. She's now 76 years old, and this week marks her 10th extended stay underwater. 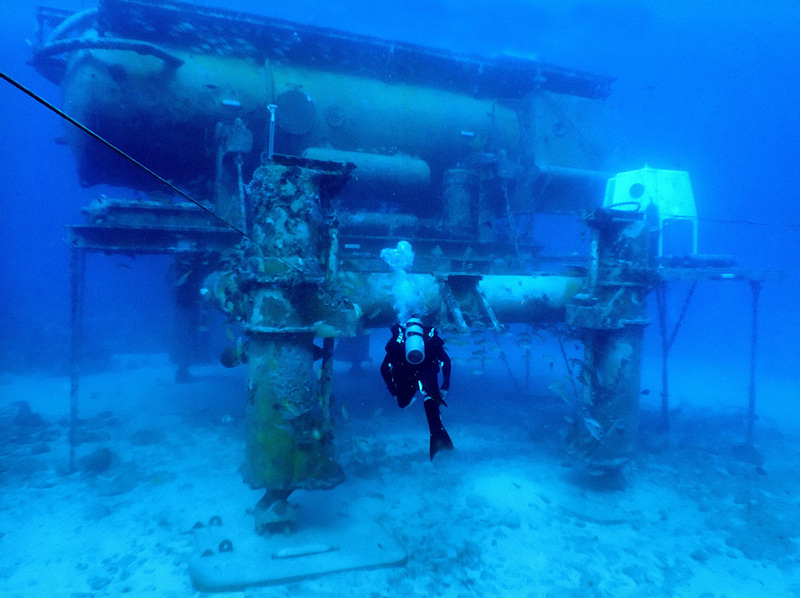 Last week, at Aquarius Reef's training facility in Key Largo, Fla., Earle said she's disappointed that saturation diving and the undersea research facilities that make it possible are still uncommon today. For marine researchers, she says, it's all about what she calls "the gift of time." "This difference in perspective you get when you don't have to bounce in and out — you have the ability to stay for hours and hours and watch that fish do its thing," she says, "or conduct an experiment without constantly looking at your watch saying, 'I've got three minutes left, I've got to go.' "
Aquarius Reef Base is owned by the federal government but run by researchers from the University of North Carolina, Wilmington. The base is an 85-ton, cylindrical steel chamber with windows — they're called viewports — and a "moon pool" entryway where divers plunge in and out of the pressurized structure. There are bunks, a galley area and room for six people. "Typically, our divers stay 10 days [and] make excursions out on the reef for about nine hours down to 95 feet," says director Tom Potts. "So we get about ... 10 times the productivity over diving from the surface." Last month, a team of NASA astronauts led by Dorothy Metcalf-Lindenburger spent 11 days at Aquarius Reef training underwater in conditions that simulate the near-zero gravity of an asteroid. 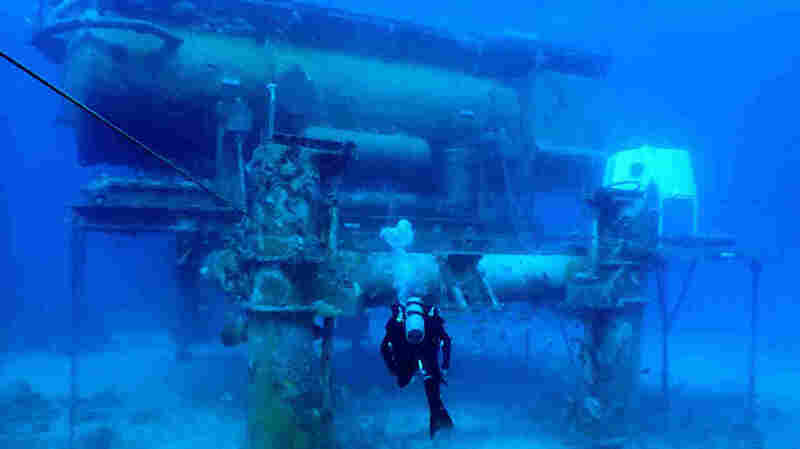 It was NASA's 16th mission at Aquarius Reef Base. At one time or another, there have been about 50 undersea research bases like Aquarius Reef around the world. Today, it's the last one that remains devoted to scientific research, and its days might be numbered. After some years of declining budgets, the Obama administration eliminated funding for the base, leaving its staff with just two options: Close up shop, or find their own money. Part of this week's mission is outreach and education aimed at helping save Aquarius Reef. On Monday, sitting in his shorts and T-shirt inside the undersea research base, lead researcher Mark Patterson, a marine science professor at the College of William and Mary, took part in a live Web chat. There have been about 50 undersea research bases like Aquarius Reef around the world. Today, it's the last one that remains devoted to scientific research. "The whole point of the habitat is actually not to be inside," Patterson said from inside the lab. "So, we're chafing at the bit to get outside into the water and begin doing our science." 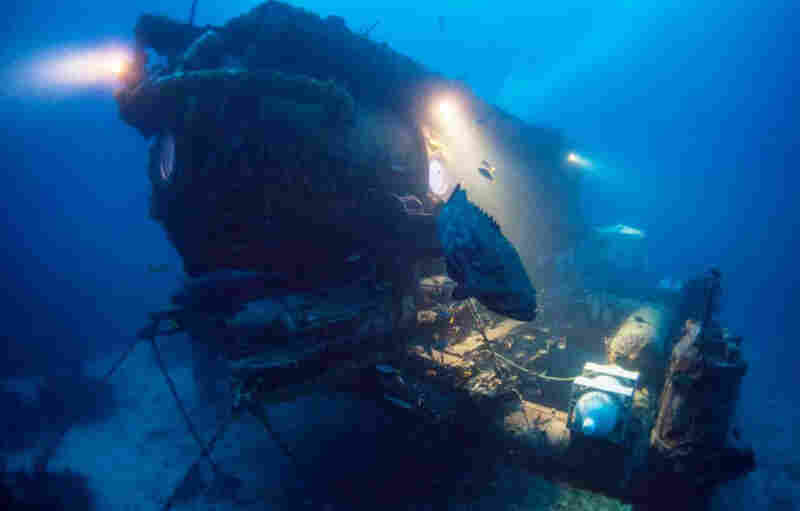 Patterson has conducted several missions over the years at Aquarius Reef. Last week, while training in Key Largo, he said it's one of the world's few underwater ecological observatories. It's a place, he said, where scientists are able to conduct measurements and experiments using delicate instruments, something not possible on a two-hour dive. "Some of the things that I've used Aquarius for through the years have involved some very careful setup that took hours to days to get the experiment going just right," he says. "The neat thing was that the corals or sponges that we were making measurements on were still in nature." Earle says the development of sophisticated robots and remote-operated vehicles has done much for ocean exploration. But interest in technology, she says, shouldn't come at the expense of manned undersea research. "You can't surprise a machine," she says, "but you certainly can surprise a human being, and a human being can react with a body of knowledge. That's the joy of exploration. "If you knew what you were going to find, you wouldn't have to go. But it's the unexpected you have to prepare for, which is what humans do," she says. In Key Largo, an independent group, the Aquarius Foundation has started to raise money to fund the research base's three million dollar annual budget so that this — Aquarius Reef's 117th mission — won't be its last.